I'm giving the slime molds a separate section from the other colonial eukaryotes because they've been more intensively studied than either the volvocaceae or the choanoflagellates considered in Eukaryote Colonies . Abstract "G-protein-coupled receptors (GPCRs) represent one of the largest gene families in the animal genome. These receptors can be classified into several groups based on the sequence similarity of their common heptahelical domain. The family 3 (or C) GPCRs are receptors for the main neurotransmitters glutamate and gamma-aminobutyric acid, for Ca(2+), for sweet and amino acid taste compounds, and for some pheromone molecules, as well as for odorants in fish. Although none of these family 3 receptors have been found in plants, members have been identified in ancient organisms, such as slime molds (Dictyostelium) and sponges. Like any other GPCRs, family 3 receptors possess a transmembrane heptahelical domain responsible for G-protein activation. However, most of these identified receptors also possess a large extracellular domain that is responsible for ligand recognition, is structurally similar to bacterial periplasmic proteins involved in the transport of small molecules, and is called a Venus Flytrap module. The recent resolution of the structure of this binding domain in one of these receptors, the metabotropic glutamate 1 receptor, together with the recent demonstration that these receptors are dimers, revealed a unique mechanism of activation for these GPCRs." "Slime mold or slime mould is an informal name given to several kinds of unrelated eukaryotic organisms that can live freely as single cells, but aggregate together to form multicellular reproductive structures." "Slime molds can generally be divided into two main groups. A plasmodial slime mold involves numerous individual cells attached to each other, forming one large membrane. This "supercell" (a syncytium) is essentially a bag of cytoplasm containing thousands of individual nuclei. By contrast, cellular slime molds spend most of their lives as individual unicellular protists, but when a chemical signal is secreted, they assemble into a cluster that acts as one organism." Note that the 'chemical signal' is not specified. "There are two major unrelated phyla of slime molds. The Myxomycota are the true (plasmoidal) slime molds, and the Dictyosteliomycota are the cellular slime molds. Both were formerly classified as fungi but are now considered protists." "A myxomycete exists in nature as a plasmodium, a multinucleate blob of protoplasm up to several centimeters in diameter, without cell walls and only a cell membrane to keep everything in. It resembles a large amoeba and feeds much the same way, by engulfing its food (mostly bacteria) with pseudopodia ("false feet"), in a process called phagocytosis . Thus the slime mold ingests its food and then digests it. (In contrast, true fungi have cell walls and digest their food externally before ingesting it.) When the plasmodium runs out of food, or environmental conditions become harsh, fruiting bodies form. These fruiting bodies produce dormant, resistive spores." 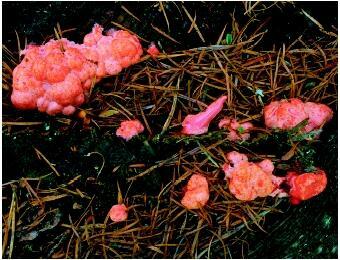 Pillows of the coral-colored slime mold Myxomycetes grow on damp wood." "The Dictyosteliomycota are also known as the social amoebae. Their life cycle is considered among the most bizarre among microorganisms. It begins with free-living amoeboid cells (not to be confused with the Amoebae); there is no true plasmodium. As long as there is enough food (usually bacteria) the amoebae thrive. However, when food runs out, the amoebae send out chemical signals to surrounding amoebae. Next, they stream toward a central point and form a sluglike multicellular pseudoplasmodium, which can then migrate like a single organism. When conditions are right, the pseudoplasmodium stops migrating and forms a multicellular fruiting body." Note that, once again, the 'chemical signals' are not specified. "They're not animals and they're not plants, and biologists want to know a lot more about them." "These are slime molds, or myxomycetes (myxos), of the kingdom Protoctista, the least understood of the five kingdoms of life, the others being animals, plants, fungi and bacteria"
"There are two kinds of slime molds: the acellular, of which there are today 1,000 known species; and the cellular, of which about 70 species have been identified. The marked difference between them is that the acellular slime molds have many nuclei but only one cell wall during the plasmodial stage, while the cellular ones are composed of individual cells. In any case, slime molds, said to be a billion or so years old, could be one of the first organisms formed by independent cells joining together." "To reach the spore state, the cellular slime molds start out as single cells that communicate by exuding certain chemicals, among them acrasin." BULL'S EYE: We've finally found the name of one of the chemicals slime molds use to communicate with one another. "Acrasin (pronounced /əˈkreɪzɛn/) a chemotactic chemical secreted by cellular Slime molds to signal that many Myxamoebae should come together to form an aggregate Pseudoplasmodium. cyclic Adenosine Monophosphate (cAMP) found in the species Dictyostelium discoideum which exhibits a complex swirling-pulsating spiral pattern when forming a pseudoplasmodium." The Wiki article on 'Acrasin', above, gave a link which identifies a second chemical messenger. "Cell aggregation in Dictyostelium discoideum is mediated by chemotaxis to cyclic AMP. Aggregative cells of the simpler species D. lacteum are not attracted by this cyclic nucleotide. We describe how the cell aggregation-inducing factor, or acrasin, of D. lacteum was purified from aggregating amoebae and characterized. The acrasin, which is mainly secreted in the aggregative phase, is identified as a derivative of pterin." "Pterin is a heterocyclic compound composed of a pyrazine ring and a pyrimidine ring (a pteridine ring system); the pyrimidine ring has a carbonyl oxygen and an amino group. " "The biosynthesis of pterins begins with the molecule Guanosine Triphosphate (GTP) ; the enzyme which controls the conversion of GTP to pterin, GTP cyclohydrolase I, is found in both prokaryotes and eukaryotes."